Amgen Scholars is hosted at thirteen premier educational institutions within the United States. Each host institution has its own application process. U.S. citizenship or permanent residency in the United States is required, and you can apply to participate at as many host institutions as you are interested in. Amgen Scholars in the U.S. Program meet in southern California each year to network with other Amgen Scholars as well as interact with leading scientists in industry and academia. What criteria do I need to meet to become an Amgen Scholar in the U.S.? Is there one application form for all of the host universities in the U.S.? No. Each host institution in the U.S. has its own application process. Can I apply to more than one host institution in the U.S.? Yes. You can apply to as many host institutions in the U.S. as you are interested in, but each host institution requires a separate application. Is there a common application deadline for all host institutions in the U.S.? In the U.S., the application deadline for host institutions is in early February, with the exception of the California Institute of Technology, for which the deadline is in mid-February. Are there certain application requirements common to all host institutions in the U.S.? Yes. The application at each host institution in the U.S. requires, at a minimum, the submission of an official transcript, a letter of recommendation and a personal statement or essay. Information about applying to each host institution is available by following the appropriate links to the host institutions’ respective applications. Are the summer program dates the same for all U.S. host universities? No. All host institutions require a full-time commitment for eight to 10 weeks, with the programs in the U.S. usually beginning in June and ending in August. The different starting and ending dates should help accommodate applicants’ varying school schedules. Note that most host institutions do not have flexibility with regard to the summer program dates, but see each institution’s Amgen Scholars Program website for more information. What is the expected number of Amgen Scholars participating annually at each host institution and in total in the U.S.? Each host institution in the U.S. will have approximately 15 Amgen Scholars each summer. With 13 host institutions in the U.S., it is expected that there will be approximately 200 Amgen Scholars in the U.S. each summer. Do I need to have attended one of the 13 host institutions in the U.S. during the academic year to apply to the Amgen Scholars Program? No. Eligible students at colleges and universities from across the United States, Puerto Rico or other U.S. territories may apply. For instance, the 2018 Amgen Scholars class in the U.S. included students from 130 different U.S. colleges and universities across 38 U.S. states and territories. What about housing, food and travel expenses to and from the summer program in the U.S.? Will there be an opportunity to meet Amgen Scholars participating in the U.S. Program at other host institutions and to learn more about biotechnology and drug discovery and development? Yes. In July, each Amgen Scholar in the U.S. attends a symposium to share their research projects and hear firsthand from leading scientists working in industry and academia. 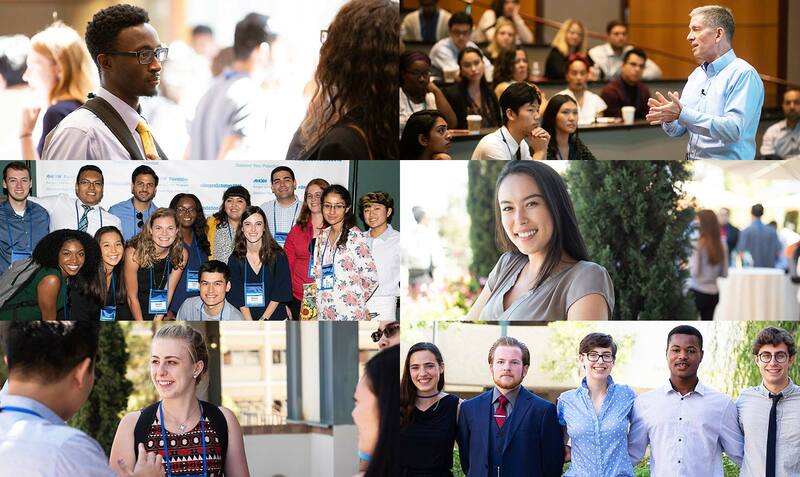 The symposium is held in California, and provides students with a valuable opportunity to network with other Amgen Scholars from across the nation. Is the cost of travel to and from the July symposium, as well as room and board at the symposium, covered by the Program? Can I apply to participate in the Amgen Scholars Program in the U.S. if I am not a science or engineering major? Do I need to have research experience prior to being admitted to the Program in the U.S.? Note that the terminology used to define research disciplines may vary across institutions. Please see each institution’s Amgen Scholars Program website for more information. Applicants to host institutions in the U.S. should be notified by the end of March. No. Students are invited to participate as an Amgen Scholar for one summer only. This ensures that each summer a new cohort of approximately 200 Amgen Scholars in the U.S. will have the opportunity to benefit from this type of hands-on research experience. Can I apply to participate as an Amgen Scholar in both the U.S. as well as in Europe, Australia, or Canada? No. Students are invited to apply to participate as an Amgen Scholar at colleges or universities in either the U.S., Europe, Australia, or Canada, primarily based on where they are currently enrolled and intend to receive their undergraduate degree. See the Eligibility sections of this website for further details and information. Can I apply to participate as an Amgen Scholar in both the U.S. and Asia? Yes. The Asia Program is open to undergraduates worldwide, so students eligible to apply to the U.S. (or Europe, Australia or Canada) Program may indeed be eligible to apply for the Asia Program as well. See the Eligibility sections of this website for further details and information. Yes. As long as you continue to meet eligibility criteria, you can certainly apply again. Whom do I contact with questions about the Amgen Scholars Program in the U.S.?